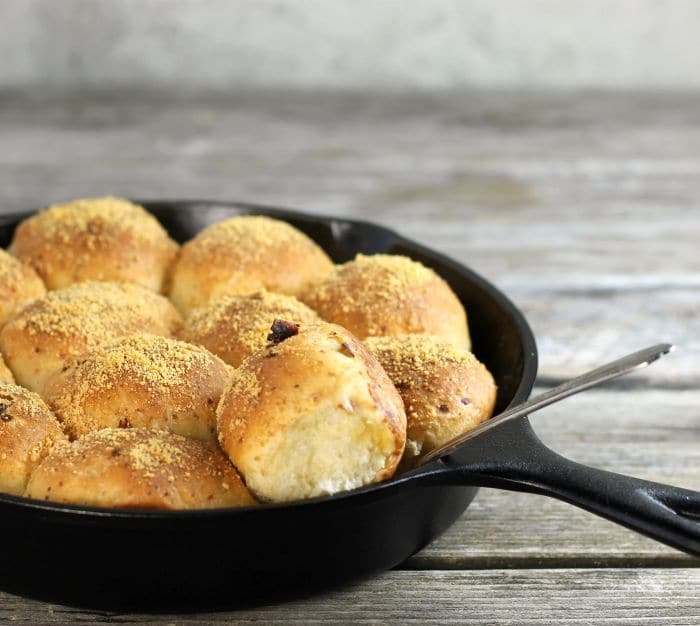 Pepperoni pull apart bread, pepperoni, Parmesan cheese, Italian seasoning, garlic powder all rolled up in these soft pull apart buns, dip them in marinara sauce or eat them plain. 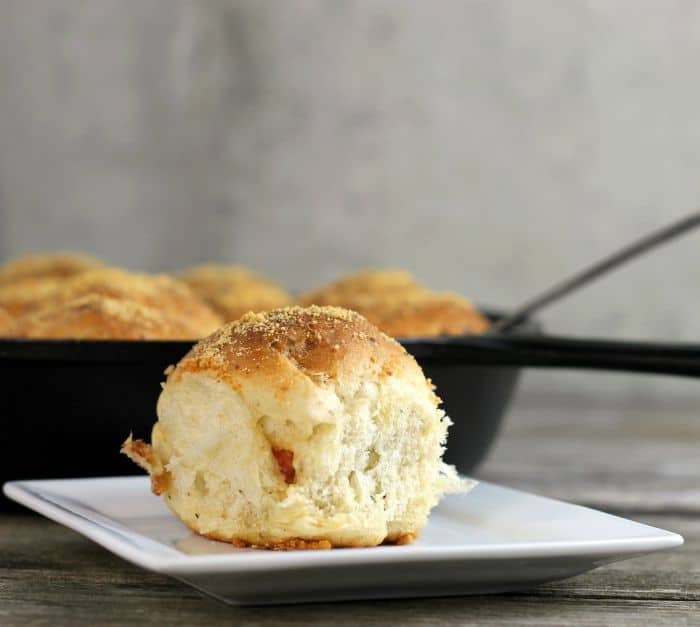 Pepperoni pull apart bread is absolutely delicious with a marinara sauce, but they are equally delicious when you eat the bread all by itself. I use my family as guinea pigs when it comes my recipe testing. This weekend the family was gathered together for Mother’s Day and our son’s birthday. I took the opportunity to bake up a batch of this pepperoni pull apart bread. It was the second time I made them. I was trying to perfect the recipe and get some opinions on the flavor of the bread. To my disappointment, the bread was a bit underbaked, but the flavor was right where I wanted it to be. This is my first bread that I have made in my cast iron skillet. I am happy with the results and I am sure that this is the beginning of many skillet breads to come. Well for this bread I made it with some of my favorite ingredients: pepperoni, Parmesan cheese, Italian seasoning, and garlic powder. The bread is soft and full of flavor. The pepperoni is chopped into small pieces so it is easier to work with. I used garlic powder for the flavor of garlic and less mess. This makes a great appetizer or you can eat it with your dinner. If you are a bread lover like me and are looking for some new recipes I hope you will check these out. Combine 1 cup flour, yeast sugar, salt, garlic powder, 1/4 cup Parmesan, and Italian seasoning in a larger bowl. Heat water until 120 to 130 degrees F. Add the water, 3 tablespoons olive oil, and pepperoni to the flour mixture. With a wooden spoon mix the ingredients until well combined. Gradually add the remaining flour until the dough is slightly sticky. As I add the flour I work it in by my hand. Knead the dough until smooth and slightly sticky. Set in a warm place, cover, and let it rest for about an hour or until double in size. Grease a 10-inch cast iron skillet. Once the bread is raised to double in size, punch down. Divide the dough into 12 equal parts. 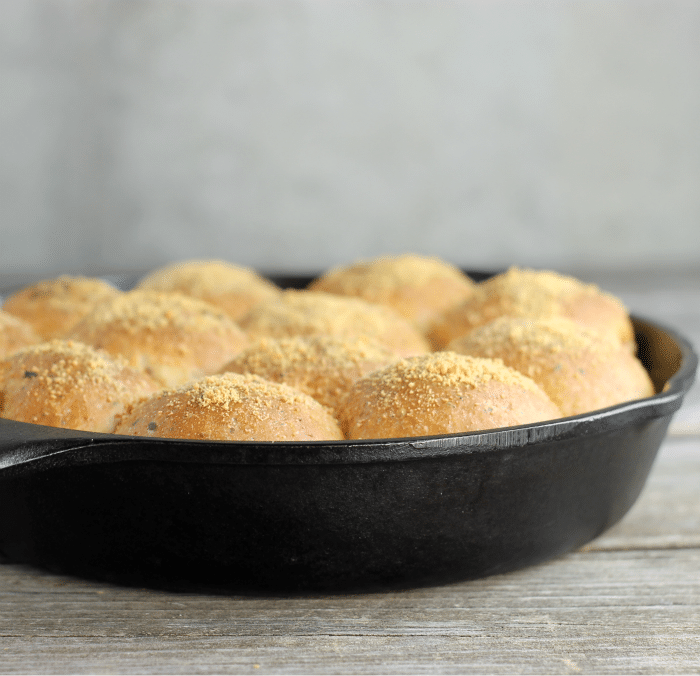 Form into balls and arrange in the skillet. Let rest for about 1/2 hour. Preheat oven to 375 degrees F. Just before the bread goes into the oven brush it with 1 tablespoon of olive oil and sprinkle with 2 tablespoons of Parmesan cheese. Bake for 25 to 27 minutes or until bread is browned. Remove from oven and enjoy. 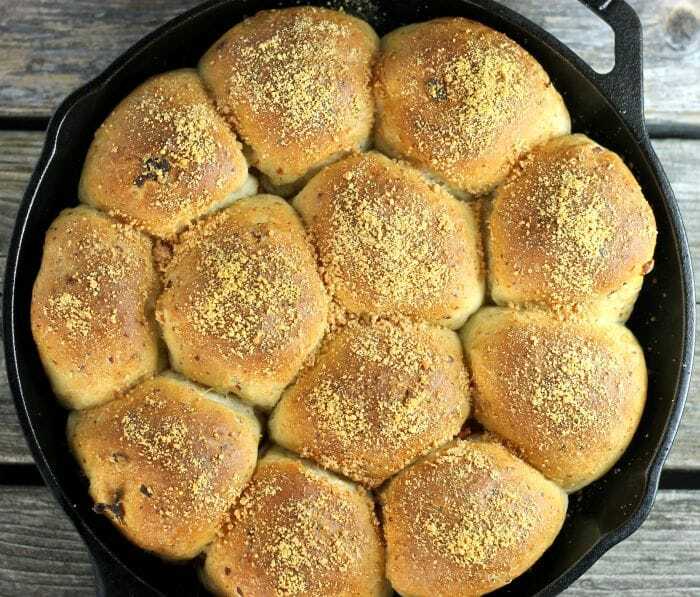 wow these pull apart buns look so soft and great! Dipping them in marinara sauce sounds like a fantastic idea, Dawn. I make something similar for Tim. Good eats. P. S. Maybe I missed it, but does the 1/4 cup Parm go in the dough with the pepperoni? Liz, thank you for catching that. Yes, the 1/4 Parm does go in with the dough. This would be so good at my next barbecue!